SA’s Nannochloropsis is a single-species concentrate. 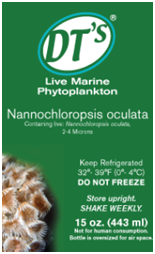 Sometimes referred-to as “greenwater,” Nannochloropsis is commonly used as a feed for rotifers and other zooplankton and as a tint and enrichment algae for use directly in larval-rearing tanks. Nannochloropsis is a small cell (about 2-4 microns) and tolerates concentration and storage very well. This product can be used similarly to the SA’s Premium Reef Blend but where a single-species product is preferred. This is the same product we use at SA to green larval tanks and to feed rotifers!